Carolyn Friedlander was in North Carolina for the weekend teaching classes. On Saturday she was scheduled to teach “Olive” at Studio Stitch in Greensboro (about 90 minutes away). At the very last-minute on Friday night, I checked with a friend to see if there were any spots left. Lucky for me there was!! 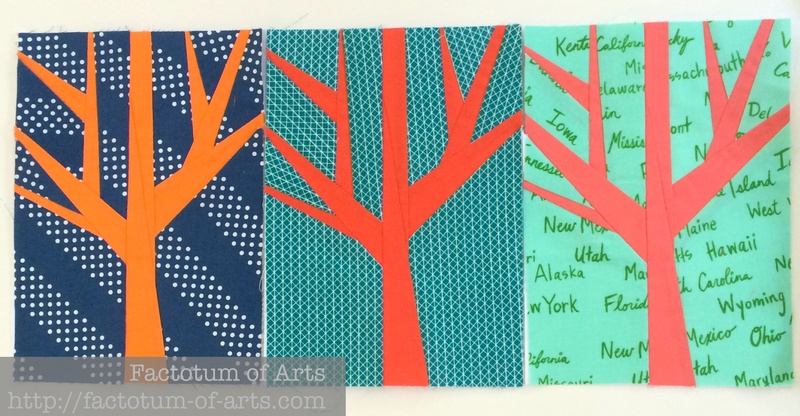 So, yesterday, I made up 3 of the 4 tree blocks in class, using Hawthorne Hues and Cotton and Steel Basics. I love the blues and the corals/oranges. One more block to go in Navy and Red. I am thinking of using Mustard, Bone and a Grey for borders. I had some happy mail this week. 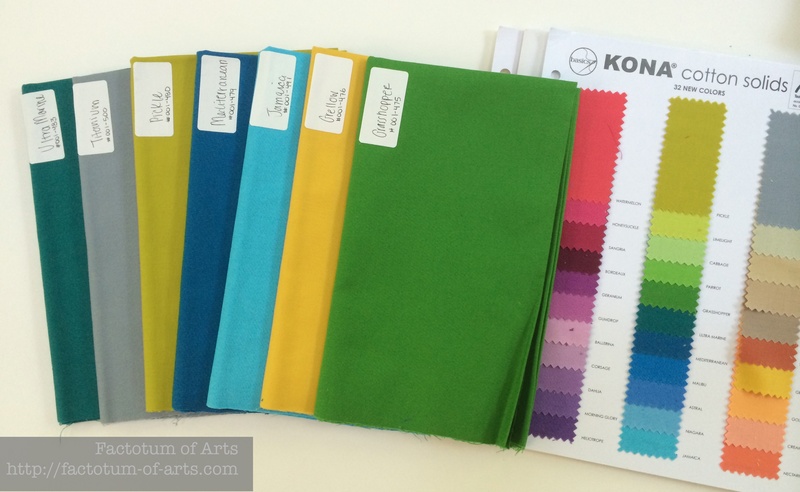 The first package is yardage of some of the new Kona solids and a new color card. I ordered from Fat Quarter Shop who has great service. Did you know that you can just add a note, at point of sale, to label your Kona cottons!!! I love it and will now always ask. Lastly, but definitely not least, I bought some of the grey, white and black prints from Frances Newcombe’s Cherie from Hawthorne threads. I love it!! I will have an update next weekend on my big tidy up….I spent all day today going through my recent purchases (probably the last 6 months), putting the yardage around the comic book boards that I use adding what I can back into my sewing room. [OH, YES….I have an overflow room at the moment]. This entry was posted in Uncategorized and tagged Carolyn Friedlander Class, Cherie, Francis Newcombe, Kona Cotton, Kona Cotton Color Card, Olive, sunday stash on August 18, 2014 by mlwilkie. Those trees are really wonderful – great colour combinations. I have the 2013 card, I should see if I can get the insert by itself. And of course you have an overflow room, isn’t that normal? Lisa, I have some “update” cards available in my etsy shop. I too have a 2013 card, but really wanted the new colors, so I made my own insert cards! Here’s the link if you are interested. I love those Carolyn Friedlander blocks, and I appreciate the tip on ordering Konas from FQS. I have a few pieces in my stash that have the name on a sticker on them, and I’ve found it to be really useful. I will always ask from now on! I am terribly jealous of your workshop with Carolyn Friedlander. She is a quilting heroine to me and the blocks that you made are fantastic. It’s a fantastic example of how the complementary colors can make the most brilliant pops! Bravo. Ps I love the dark blue cotton+steel dottie you used, which one is it?